Were you around when tape players and recorders were the big thing? I was. I remember getting my first double cassette player/geto-blaster from my grandparents, and thinking I had won the lottery! 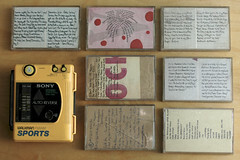 Now I could record my favourite songs off the radio, and mix them with my favourite songs from other tapes. Eventually I was able to tape songs off my records too. This made for the best mixed tapes EVER! I would spend hours listening to the radio for the right moment to hit the record button. The newest White Snake song? Got it. The best song by Aerosmith? Got it. Every song off Van Halen 1. Yup. Got it. It was the start to personalizing your music. At least without having to buy hundreds of 7″ singles. And, you could take your mixed tapes in the car, play at your friend’s house, or if you were lucky, you had a Walkman! Music in your pocket! Nowadays, the music industry is a disaster. In an age where everyone listens to their iPods, why is the music industry so far behind the times? Without the need to deliver, press the CD, make a case, or buy advertising in the local newspapers, why are digital albums so damn expensive? Where is the $2 download? People wouldn’t download for free via BitTorrent if we got our own copy of an album that we could download over and over again as needed and they let us play it as we wanted. Sure, wrap it up with my name attached to the file. I wouldn’t care, because I owned the album. Just like I owned my records and tapes. This brings me to the movie industry. In my opinion, they are the worst! I can’t stand renting a movie and it taking 30 minutes to get to the beginning of the movie. Why not offer two options? The full priced $10 digital download to burn to DVD with no car ads, previews, and warnings, and a $2 digital download with all that crap! I recall when CD and DVDs came out. They were promised to be permanent. The music wouldn’t get wrecked in your tape player, and your movies wouldn’t miss the most important scenes as your VHS ate the tape. But they weren’t perfect. They got scratched to hell. So, people want to make a copy. Just like the old days when we taped our mixed tapes, and recorded movies on our VHS. As it stands now, people are doing jail time for this! My ex made some comment about this not being right. But you know, I think once I’ve bought a movie, or CD, or bought something from the iTunes store, I own it. I don’t think I should have to rebuy it over and over again because the quality of the product is lacking. The industry already gets a tax right up front from all the blank CDs and DVDs I’ve used. They’ve been paid more than once in my opinion. I don’t buy the argument that I am renting the media and paying to use it. What are your thoughts on ripping movies, copying music, and backing up your media? wow, you brought back memories. Just a thought, since I am a Security officer and paralegal, it is not right that we cannot have a tiny tape recorder in court hearings. I have the tiniest recorder and it records pretty far away. Anyhow to prove to my boss the crap that was going on, I recorded it. My boss loved it.